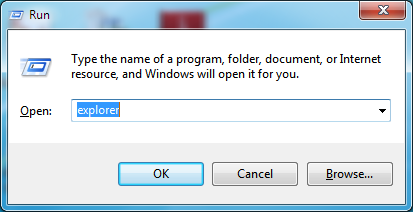 You are running a 32-bit application. 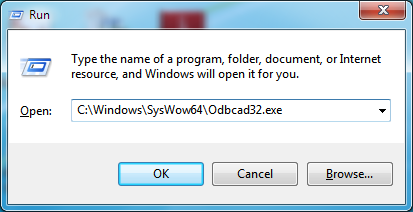 You are using a 64-bit operating system. You want to access Fernhill SCADA via an ODBC System DSN. To setup a 32-bit ODBC System DSN you need to open the 32-bit ODBC Data Source Administrator. Once open, the setup procedure is the same as Setting up an ODBC System DSN. 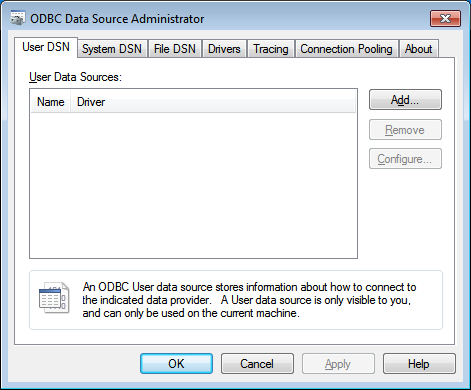 Open the 32-bit ODBC Data Source Administrator directly from the Control Panel. Open the 32-bit ODBC Data Source Administrator using a command prompt. Follow the procedure outlined below. 4. The rest of this setup follows the same steps as Step 4 of Setting up an ODBC System Data Source Name (DSN). For instructions on setting up an ODBC System DSN. For an overview of the different types of ODBC Data Source Name.